The revolutionary new and lighter platform, combined with the Ergolock System, maximizes control in any condition, making the RXT-X the new benchmark for rough water performance. With the 300-hp engine, 96 km/h is just a few seconds away. The first watercraft to hang out on the water with the largest swim platform in the industry. Flat, stable and comfortable, it is ideal for re-boarding, lounging, and prepping for tow sports. Create even more space by removing the rear seat. The narrow racing seat places your knees closer together to hold on tighter while improving the transition into standup riding. Plus, the removable rear seat gives you even more space for hanging out on the rear platform, sunbathing or a face-to-face picnic. All your gear is now within arm’s reach. The first direct-access front storage opens by simply raising the handlebar assembly. No standing required. It’s the smartest water-resistant storage ever built into a watercraft, offering room for your next adventure. Extra rear storage is now possible with the secure Quick-Attach LinQ System. It allows to easily snap a fuel caddy and a bag, or a cooler, to the back of your watercraft using two convenient, integrated attachment points. Allows you to stop up to 160 feet (48 m)* sooner than watercraft not using a brake. Riders can engage forward, neutral, and reverse for stable, worry-free maneuvering at low speeds. Choose how you want your power delivered thanks to different riding modes such as Touring, Sport, and ECO – available through your watercraft digital information center. Add on the performance package. With X-Sponsons for cornering stability and an innovative ErgoLock System featuring a narrow racing seat, specially angled footwell wedges and adjustable X-steering. 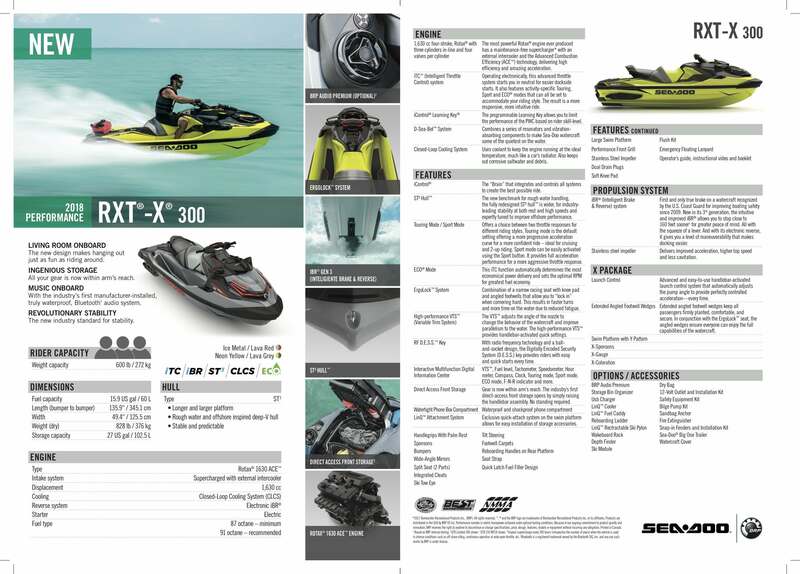 The most powerful engine on a Sea-Doo, ever! Supercharged with an external intercooler, the Advanced Combustion Efficiency (ACE) technology delivers high efficiency and amazing acceleration. This is the most powerful engine on a Sea-Doo producing a thrilling 300-hp. Quickly access the Variable Trim System (VTS) on the handlebar for fine-tuned handling based on rider preference, water conditions, and number of passengers. Plus a handlebar-activated launch control to provide perfectly controlled acceleration. ROTAX 1,630 CC FOUR-STROKEThe most powerful Rotax engine ever has a maintenance-free supercharge and the Advanced Combustion Efficiency (ACE) technology, delivering high efficiency and amazing acceleration. With three cyclinders in-line and four valves per cylinder. iTC™ (INTELLIGENT THROTTLE CONTROL) SYSTEMOperating electronically, this advanced throttle system starts you in neutral for easier dockside starts. It also features activity-specific Touring, Sport and ECO™ modes that can all be set to accommodate your riding style. The result is a more responsive, more intuitive ride. iCONTROL LEARNING KEYThe programmable Learning Key allows you to limit the performance of the PWC based on rider skill-level. 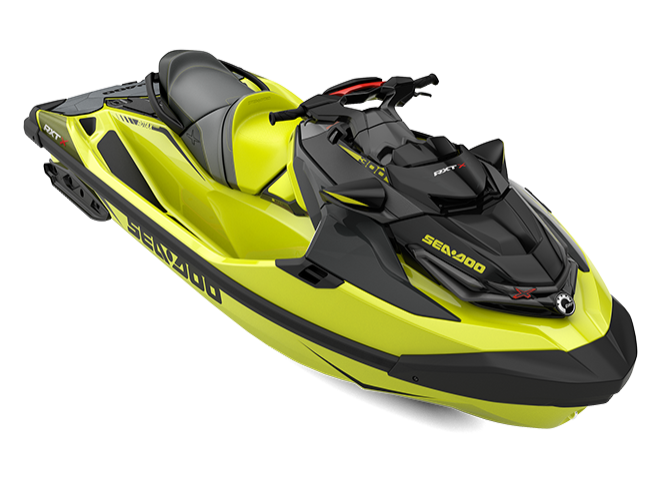 D-SEA-BEL™ SYSTEM Combines a series of resonators and vibration-absorbing components to make Sea-Doo watercraft some of the quietest on the water. CLOSED-LOOP COOLING SYSTEMUses coolant to keep the engine running at the ideal temperature, much like a car’s radiator. Also keeps out corrosive saltwater and debris. iCONTROLThe “Brain” that integrates and controls all systems to create the best possible ride. ST³ HULL®The new benchmark for rough water handling, the fully redesigned ST³ Hull is wider, for industry leading stability at both rest and high speeds and expertly tuned to improve offshore performance. TOURING MODE / SPORT MODEOffers a choice between two throttle responses for different riding styles. Touring mode is the default setting offering a more progressive acceleration curve for a more confident ride – ideal for cruising and 2-up riding. Sport mode can be easily activated using the Sport button. It provides all acceleration performance for a more aggressive throttle response. ECO MODEThis iTC function automatically determines the most economical power delivery and sets the optimal RPM for greatest fuel economy. ERGOLOCK™ SEATSeat with narrow profile and knee support that lets riders sit in a more natural position and lock in with their legs for more control and less upper body fatigue. HIGH-PERFORMANCE VTS™ (VARIABLE TRIM SYSTEM)The VTS adjusts the angle of the nozzle to changethe behavior of the watercraft and improveparallelism to the water. The high-performance VTSprovides handlebar-activated quick settings. SKI TOW EYEFor easy and secure attachment of ski rope. RF D.E.S.S.™ KEYWith radio frequency technology and a ball-andsocket design, the Digitally Encoded Security System (D.E.S.S.) key provides riders with easy and quick starts every time. INTERACTIVE MULTIFUNCTION DIGITAL INFORMATION CENTER VTSFuel level, Tachometer, Speedometer, Hour meter, Compass, Clock, Touring mode, Sport mode, ECO mode, F-N-R indicator and more. 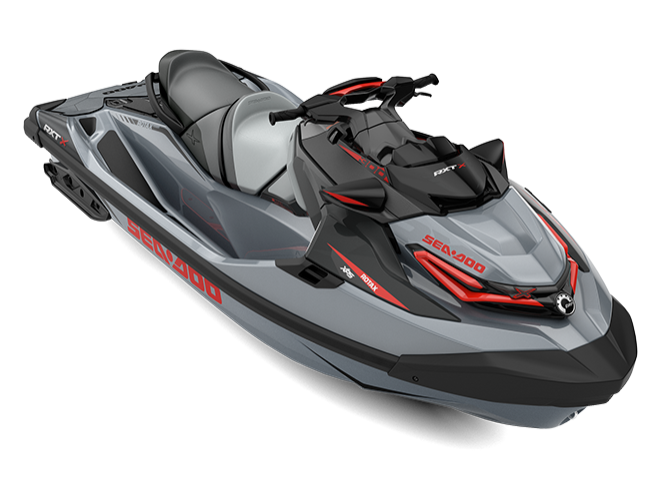 BRP AUDIO PREMIUMThe industries first fully-integrated waterproofAudio System will keep the party going anywhereyou do, with 100 watts of total system power,fully-waterproof performance, Bluetooth connectivity,and external playback controls to ensure the perfectsong is always on deck. NEW REBOARDING LADDERNow deeper and wider, it makes reboarding from the water easier and quicker. DIRECT ACCESS FRONT STORAGEGear is now within arm’s reach. The industry’s first direct-access front storage opens by simply raising the handlebar assembly. No standing required. LINQ ATTACHMENT SYSTEMExclusive quick-attach system on the swim platform allows for easy installation of storage accessories. Nauti Parts will use the information you provide on this form to be in touch with you and to provide updates and marketing. Please let us know all the ways you would like to hear from us. You can change your mind at any time by clicking the unsubscribe link in the footer of any email you receive from us, or by contacting us at nautiparts@yahoo.com. We will treat your information with respect. For more information about our privacy practices please visit our website. By clicking below, you agree that we may process your information in accordance with these terms.